Logo Motion is played on a 27-by-54 foot carpeted field divided into feeding lanes, scoring zones and the remainder of the playing field. Logo Motion consists of two alliances of three teams each, trying to hang as many "logo pieces" on their 3-by-3 scoring grids. The higher the row on the scoring grid, the more points awarded for a hung logo piece. 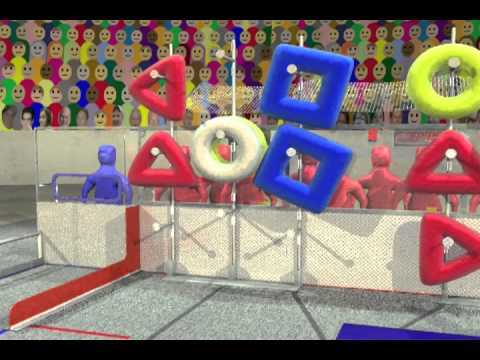 During the first fifteen seconds of the match, robots autonomously try to hang "ubertubes" for a doubling bonus for that tube and the peg on which it is hung. During the next two minutes, drivers try to retrieve logo pieces and hang them on their scoring grids. A doubling bonus is awarded if the FIRST logo is properly created (in the order triangle, circle, square). The match ends with robots deploying "minibots" up 10 foot high vertical poles, with the minibots making it to the top first earning a greater amount of bonus points. Drive: Encoders on each side of the drivetrain are used to calculate velocity and displacement. A gyro is used to keep track of angle. The 2011 season began with heavy hearts for the Simbotics team and family as founding member Stephen Rourke tragically passed away in May of 2010. The 2011 robot was named Simbot Steve to honour Steve who represented a mentor, a friend, a colleague, and even a father figure to members of our large Simbot family. The regional season ended with three regional victories for Simbot Steve and wins in Pittsburgh and Toronto were with another team founded by Steve Rourke, fellow NiagaraFIRST team, Spartonics (Team 1503). The Waterloo Regional was won with our friends from OP Robotics (Team 2056) and a rookie team founded and mentored by Simbotics, Team 3756 Ram-ferno. The event also saw a world-wide high score set and then surpassed by our own alliance one match later. During the regional season, Team 1114 also received three technical awards and received recognition off the field with two Dean's List Finalist Awards, two website awards, an Outstanding Volunteer of the Year and the Greater Toronto East Regional Chairman's Award. At the World Championships, Simbotics finished out of the top 8 and were selected by the number one alliance and were unfortunately eliminated in the semi-finals. Chairman's Presenters: Craig R, Brittany S, Matthew C.
The final event of 1114's season was again the Indiana Robotics Invitational. The 2011 field was tough, including two 2011 World Champions and nine Divisional Champions. With some rule changes and a very strong group of competitors, matches were all very high scoring and had tight margins of victory. Friday's tough qualifying matches left only two undefeated teams, 1114 (7-0-0) and 1126 (6-0-0). Simbotics entered the 2011 Championships hoping to improve upon last year's World Finalists placing. Joining Team 1114 in the Galileo Division were many strong teams including 254, 469, 111 and fellow Canadian teams 610 and 188. After Thursday and Friday qualifying matches, a few tough losses left us at 6-2-0 in 16th place.